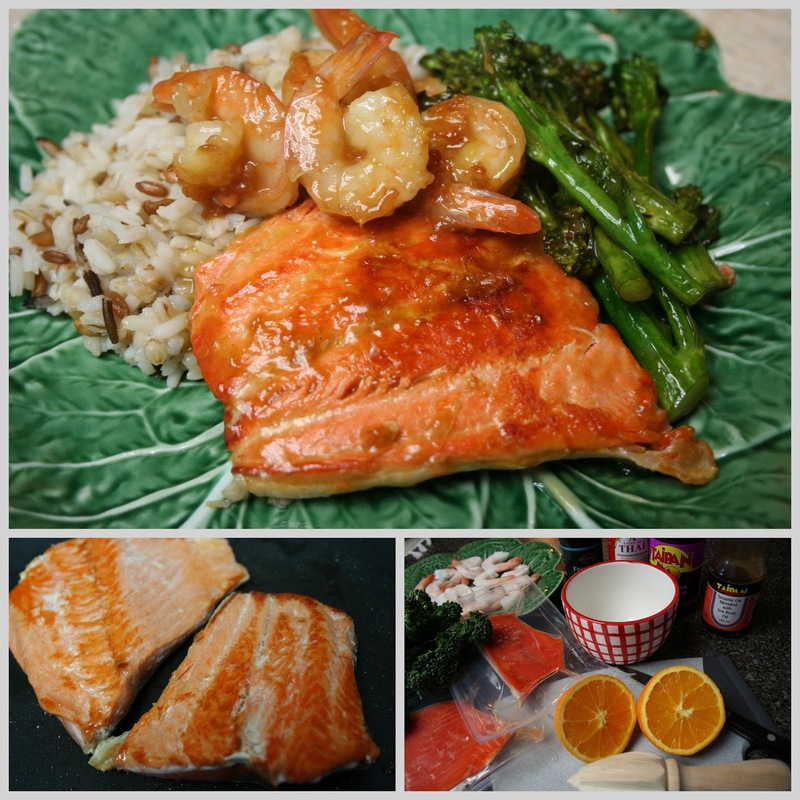 I usually have individually wrapped portion sized salmon pieces as well as a bag of shrimp in the freezer for quick thaw meals. Start your rice when you begin your salmon and the meal will come together in about 30 minutes. The instructions are for four portions. .but can be easily increased or the sauce can be halved to make a meal for two. You can find the sauce ingredients in the Asian section of your grocery store. Combine the orange juice, hoisin sauce, fish sauce, sesame oil and chili pepper sauce in a small bowl. Add the cornstarch and water and set aside. Heat half the oil in a large fry pan and add the shrimp. Toss around in the hot oil until the shrimp turns opaque and slightly pink. Remove to a plate. Add the salmon portions and brown on both sides on medium heat. Turn the heat down slightly and fry until opaque and flakes to the center. Add to the set-aside shrimp. Add the rest of the oil to the pan and stir-fry the broccolini/asparagus several minutes on medium-high heat until tender crisp. Add the salmon and shrimp back to the pan and add the sauce. Stir carefully until the sauce thickens and becomes shiny and clear. I'm off to the freezer to see what my salmon supply looks like. This sounds very tasty! It had to be a fantastic dinner!! I can taste it! Looks wonderful Lovella! Oh my - that looks delicious! I just made a new grocery list with those ingredients. I've never cooked with some of those Asian sauces but I'm going to give it a try! Thanks Lovella! Looks delish! What kind of rice is that you have served with it?? this looks so tasty Lovella! I really like this sauce for the salmon, it sounds wonderful. I recognize that fish....I wonder? I better check if I still have mine in the freezer. Thanks for the new sauce. Looks delicious.